This year I had the had the fun of climbing the West Pillar of Eichorn Pinnacle twice. Between both visits I climbed both variations (Regular & Direct), including both P5 variations (5.8 rib wrestling and 5.9 OW/flare/stem). The following are two mini photo trip reports of each variation. Eichorn Pinnacle seen near Cathedral Lakes. 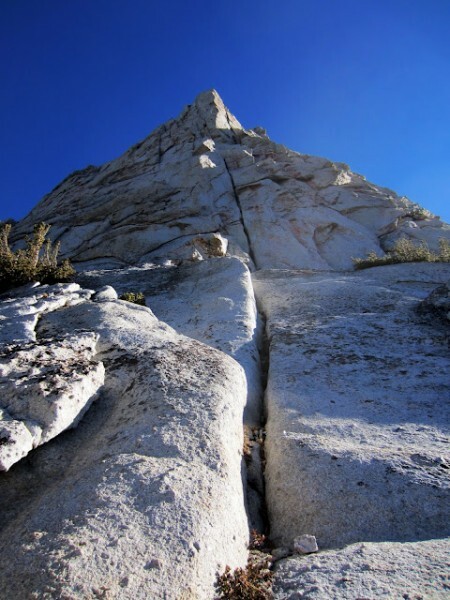 Hubert Koepfer and I took advantage of the last day that the High Sierra was likely to be open for rock climbing this winter season by climbing Eichorn Pinnacle car-to-car. We did the classic West Pillar route, which had some nice burly wide climbing. One of the more memorable parts of the climb was hearing the lakes in the valley below as they emitted moans & rumbles from cracking and shifting ice! Some noises sounded like whale calls echoing over the alpine valleys. Eichorn Pinnacle seen on the x-country approach from the trail. The West Pillar is bulging to the right. The West Pillar of Eichorn Pinnacle (5.9, 5P). Just follow the wide crack! The easier original variation goes to the right of the prow. The slightly better direct variation (5.10b) goes to the left. The West Pillar of Eichorn Pinnacle (5.9, 5P). The easier original variation goes to the right of the prow (5.9) up a flare and crack behind a large detached flake. The slightly better direct variation (5.10b) goes to the left. Being January and all, it was pretty cold in the shade. Since I suffer a bit from Reynaud's Syndrome in my hands, it was painful to start climbing! Fortunately I got to the wide sections quickly, which are much more manageable in the cold. After some strenuous chickenwinging and leg camming in the OW I emerged into warm sunshine. Looking up the prow from the 5.4 slab traverse & downclimb. The objective of P2 is to climb the steep 5.9 flare on the right. Oddly the SuperTopo lists the P2 5.9 crux to be the flaring corner. I found this part to be pretty solid and fun and felt like the real crux of the pitch was an awkward climb out and to the left of a little roof encountered after the 5.4 traverse. The 5.9 flare. Really not too hard (more like 5.8) and pretty fun. The angle of the cracks seemed best climbed with hand jams by crossing my arms just short of the wrists in sort of a 'crucifix jam'. I chose to continue straight up the harder 5.8 corner variation instead of stepping right for the easier variation. The corner was great, with solid rock and made the pitch a lot better. If you are doing the regular variation, take this 5.8 corner! Hubert at the P2 belay. Chill 5.7 terrain. Sustained at the grade and really fun. Steep, mostly well protected, and there are many ways to go. Just take the line that looks like the most fun! P5 5.8 'rib wrestling'. I didn't understand this statement in the topo but it becomes self-explanatory once you do it. This section was harder and scarier than it looked. Yikes! P5 5.8 'rib wrestling', looking down after the match. P5 almost to the summit, joining the regular route. Cathedral Pk summits seen from Eichorn Pinnacle in the fading glow of sunset. Due to the short day and some relaxing in the sun lower down, we topped out right after sunset. It was nice having the climb and summit area to ourselves! We rappelled in the dark and spent the next hour downclimbing snow covered slabs in our climbing shoes to retrieve our shoes left at the base. A storm was forecast for the next day, so we went to the Valley to climb Flatus on Sunday. This climb was perfectly timed as the Sunday storm was the winter storm that finally closed Tioga pass for the season. On the first climb we downclimbed to the start of the route to get our shoes. Perhaps doing this in climbing shoes on snow covered slabs in the dark had something to do with it, but this option sucked. On the second climb we took the Cathedral Peak climber's trail descent and this was a much nicer way to go. For leading either variation nothing smaller than a 0.3 Camalot or #1 Metolius is needed (#1 or #2 C3s can be helpful on the P1 crux). Also, doubles through #3 Camalot should allow one to climb comfortably. A #4 Camalot could be placed on P1 but is very optional. The P5 OW variation is protected just fine with #2 & #3 Camalots, though a #4 could optionally be placed too.